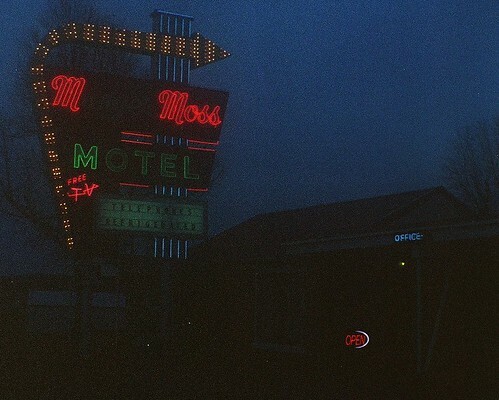 You’d better believe I took one of my old cameras along on my family’s Route 66 trip. 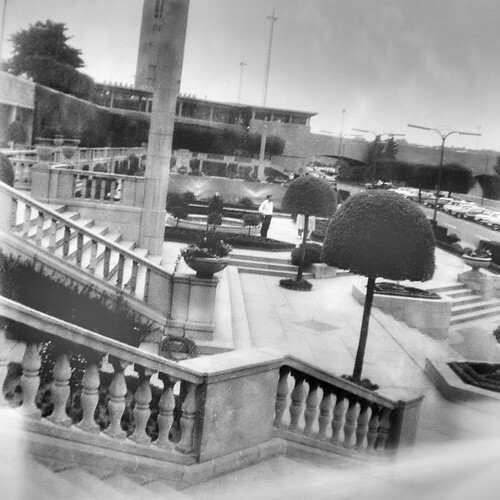 Kodak’s 1950s Brownie Hawkeye undoubtedly shot millions of vacations in the middle of the last century, and it is relatively compact and dead simple to use. It seemed like the perfect companion for my family’s Route 66 vacation. 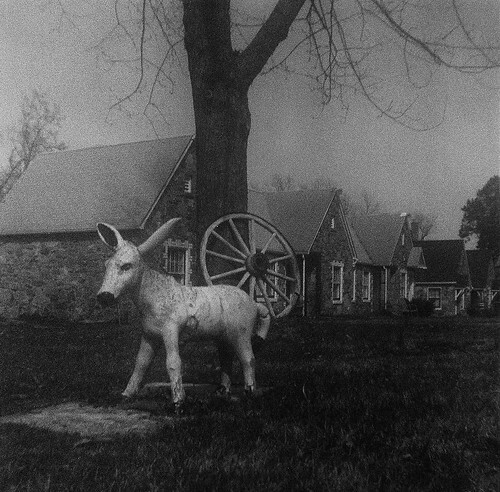 The previous owner of my Brownie Hawkeye thought it was a good vacation camera, too. This camera’s last use was to shoot a Niagara Falls vacation in the late 1960s – see those photos here. 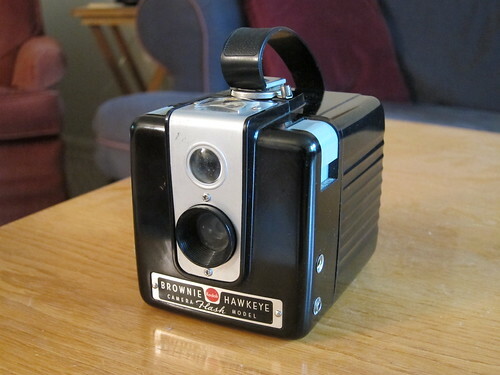 The Brownie Hawkeye takes 620 film, which hasn’t been made in almost 20 years. I’ve been known to buy fresh film hand-respooled onto 620 spools. But last year I bought a flatbed film scanner and scanned some negatives from a roll of Kodak Verichrome Pan I shot in 1976, when I was a lad of 10. See those photos here. 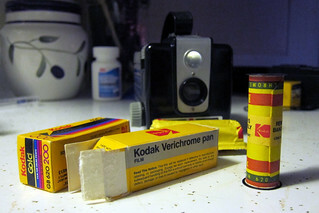 Verichrome Pan was arguably the number one amateur black-and-white film in the United States from its introduction in 1956 to its discontinuation about four decades later. I itched to shoot one more roll, so I bought one on eBay. It expired in September, 1985. This was strictly an exercise in nostalgia. There’s a happy contingent of film photographers who like expired film’s unpredictable results. I am not among them. Expired Verichrome Pan has a good reputation for returning usable images, and the roll I bought was advertised as having been stored cold, which should have preserved it. I was disappointed that this roll returned faint, noisy images. I monkeyed around with the scans in Photoshop to darken them up and bring out some contrast. 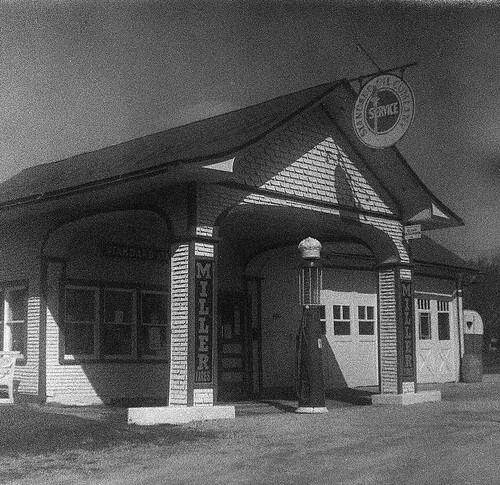 This is the 1932 Standard service station in Odell, Illinois. See more photos of it here. Here’s a shot from the Wagon Wheel Motel in Cuba, Missouri; see more photos here. These dilapidated log cabins are part of John’s Modern Cabins, an abandoned motel of sorts on an abandoned stretch of the Mother Road west of Doolittle, Missouri. I’ll write more about these cabins in an upcoming post. Not long ago, the Film Photography Project found a cache of 620 Kodak Gold 200 film in England, expired since June of 1996 but stored cold ever since. 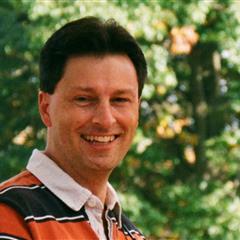 They offered it for sale; some is still available as I publish this post. Click here to buy some – but brace for impact, as it is not cheap. I bought two rolls and put one into my Brownie Hawkeye. Now, the Hawkeye was built for the slow films of the 1950s. Verichrome Pan, at ISO 125, was a pretty fast film at the time. So I figured that I’d get a whole roll of overexposed shots from this ISO 200 color film, and I was right. Fortunately, I know a couple Photoshop tricks that brought out color and detail in the washed-out images. 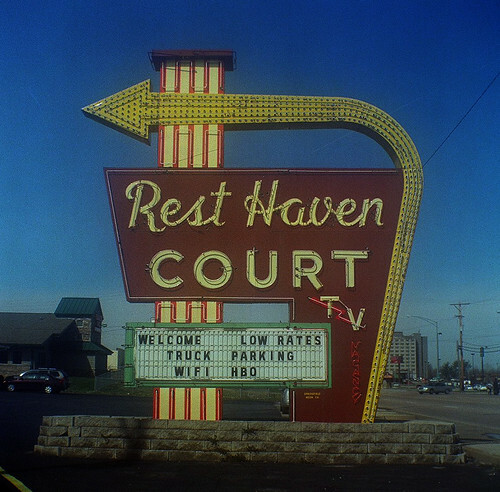 This photo is of the great sign of the Rest Haven Court on the Mother Road in Springfield, Missouri. I really like the color in this shot. Some thick clouds had rolled in when we reached Carthage, Missouri. They created quite a mood for this photograph. This is Pops, which is out in the middle of nowhere east of Oklahoma City. 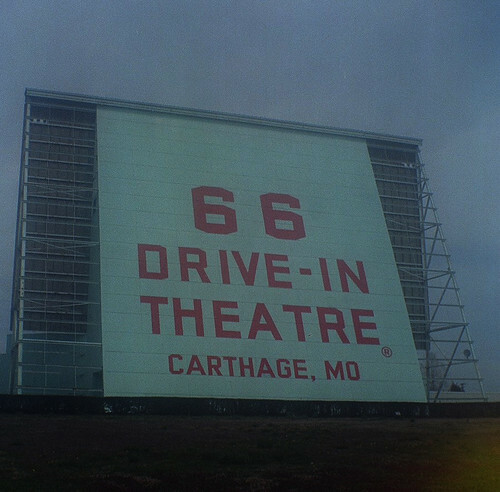 (There’s a whole lot of middle of nowhere on Route 66 in Oklahoma.) I’ll write more about Pops in an upcoming post. 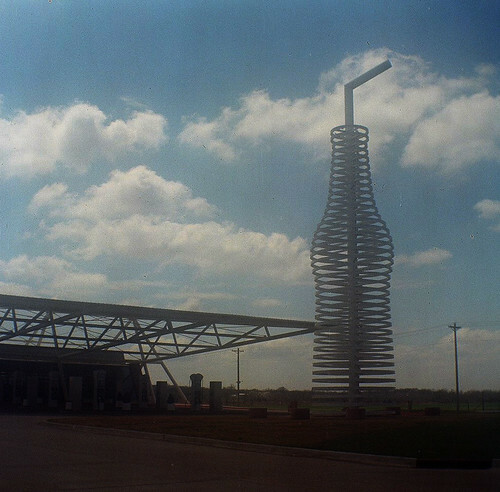 Meanwhile, dig the 66-foot-tall pop-bottle sculpture. The Brownie Hawkeye is super easy to use. You hold it at bellybutton level and peer down into the viewfinder; when you like the framing, you gently press down the shutter button. I did lose three frames on the roll of Verichrome Pan when the latch gave way and the camera opened. And then I dropped the Brownie Hawkeye while photographing the Blue Whale of Catoosa; fortunately, this only scuffed the aluminum and chipped a tiny bit of the body. 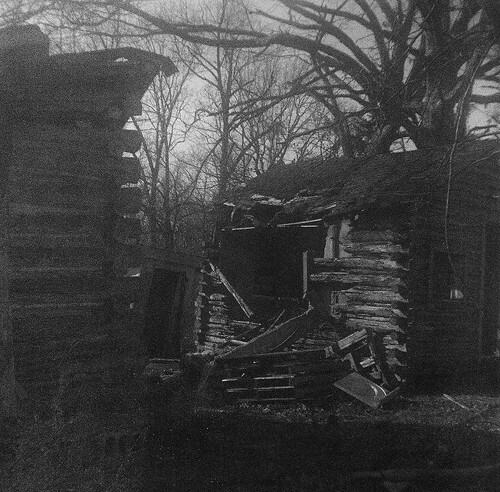 Even if the fall had irreparably damaged the Brownie Hawkeye, they remain plentiful and inexpensive. I have one more roll of the expired Kodak Gold 200 left. I’d like to see how this film can really perform, so I plan to shoot it in a 620 camera that lets me adjust exposure and packs a fine lens, such as my Kodak Monitor Six-20. a Brownie Reflex and a Brownie Starmatic. I tend to shy away from cameras that take 620 film. I’ve bought a few, such as my Kodak Tourist and my Kodak Six-20 – they’re plentiful because Kodak (and other manufacturers) puked out bazillions of them. But in 1995 Kodak discontinued 620 film, instantly orphaning them all. I’ve never understood what Kodak was trying to accomplish with 620 film as it is nothing more than still-available 120 film wound onto thinner spools. At least this makes it still possible to shoot with 620 cameras, albeit with some hassle. Hardy souls roll 120 film onto 620 spools; well-heeled souls buy it already respooled from B&H Photo. The Kodak Brownie Hawkeye takes 620 film. It is a glorified box camera, but such was the state of proletarian photography for much of the 20th century. I love it when a simple camera gets good results, and so I was charmed when I saw the great images well-known camera guy Ken Rockwell got with a Brownie Hawkeye last year on Route 66. I immediately bought one. It came in its box. 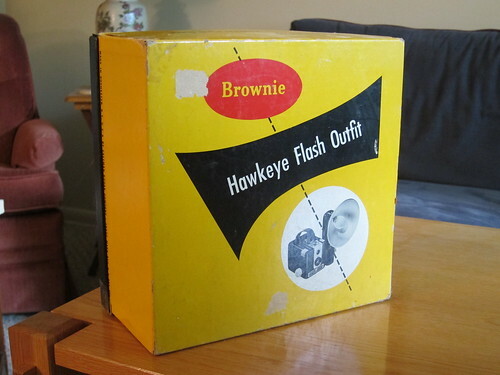 The Brownie Hawkeye was introduced in 1949; the flash model followed in 1950. They cost $5.50 and $7, respectively, which is about $51 and $65 today. Its Bakelite plastic body probably looked modern and pleasant in those days, but certainly looked outdated in 1961 when this camera finally went out of production. It sports a single-element meniscus lens; people who have tried to calculate its aperture have arrived at results from f/14 to f/16. Pressing the ridged gray button that wraps around the camera’s top right corner (as you peer through the viewfinder) fires the shutter, which stays open for 1/30 second. If you pull up the smooth gray button that wraps around the camera’s top left corner, the shutter stays open as long as you hold the shutter button down. The flash model has two pins on the side that accept several Kodak flash units. To load film, clip in a new roll up top, thread the film around the back, and insert the film leader into a takeup spool on the bottom. Put the back on the camera, lock it closed with the little slider on top under the handle, and slowly turn the winding knob until 1 appears in the little red window on the camera’s back. To frame a shot, hold the camera in front of your torso and look down into the viewfinder. Press the shutter button when you’re ready. The shutter button doesn’t lock after you press it, so if you press it again you’ll get a double exposure. 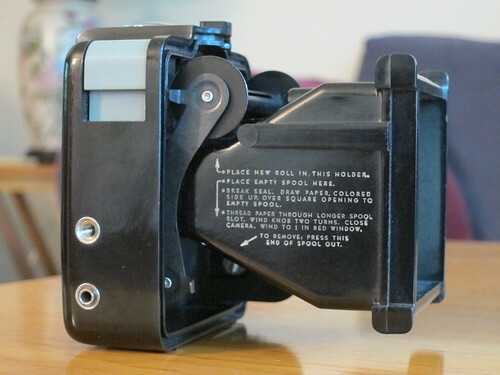 The Brownie Hawkeye had a number of running changes during its 11-year run. Early cameras had metal winding knobs and little rivets next to the flash pins. Kodak fitted glass lenses and viewfinders at first, but switched to plastic in later cameras. The button for long exposures has various markings, from B (for bulb) to L (for long) to LONG, depending on when the camera was made. Mine has a CAMEROSITY code of CYRM, meaning it was made in November, 1953. Its winding knob is plastic, and its lens and viewfinder are glass. Its long exposure button is marked L.
Many collectors report that some Brownie Hawkeyes can accept 120 film on the supply spool, which would certainly make it less of a hassle to shoot with this camera. I might try it one day. But this Brownie Hawkeye had a special gift hidden inside – a roll of exposed Verichrome Pan film. I sent it right off to Film Rescue International, which specializes in getting images from long-expired film. I was delighted when they returned several good images. 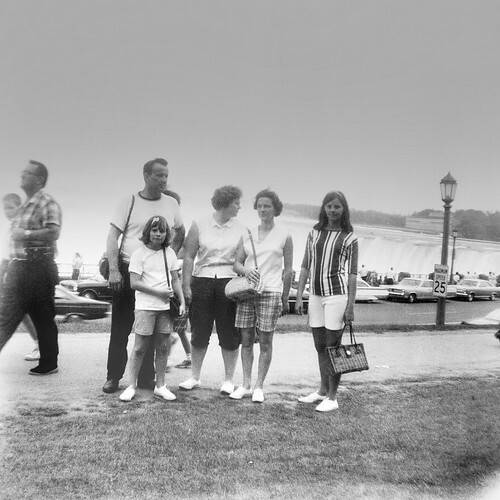 Judging by the cars and the scenery, it appears that this family visited Niagara Falls in the late 1960s. 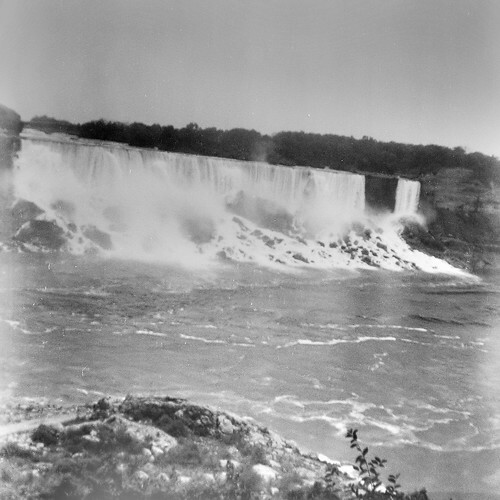 The roll features several shots of the falls. My experience with small waist-level viewfinders is that framing a level shot can be challenging. This photographer would probably agree – if he or she could see these photos. Film Rescue International got ten shots off this roll. You can see them all in this set on Flickr.